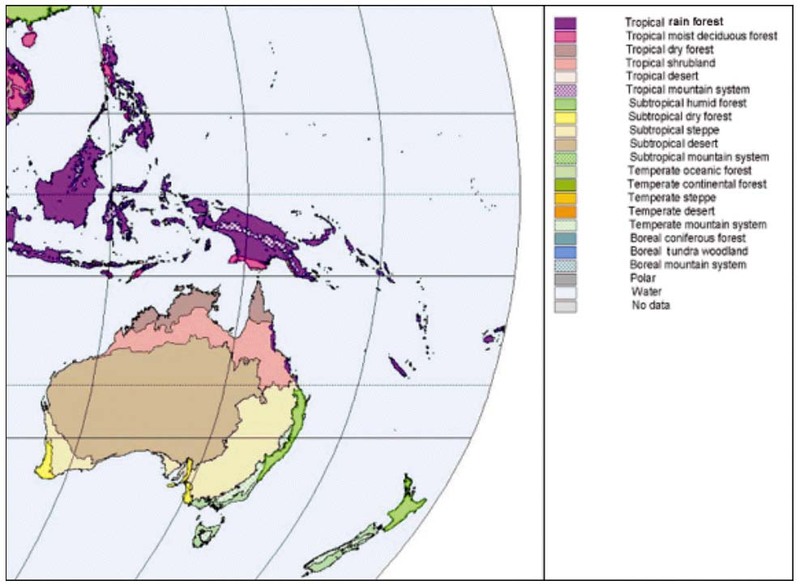 Figure 38-1 shows distribution of ecological zones in Oceania. Table 38-1 contains area statistics for the zones by subregion and Table 38-2 indicates the proportion of forest in each zone by subregion. Oceania comprises of Australia, New Zealand, Papua New Guinea and the Pacific Islands (Micronesian, Melanesian and Polynesian archipelagos). The descriptions of the ecological zones of Papua New Guinea are dealt with under Asia. This country forms an ecological entity with the western half of the island of New Guinea, Irian Jaya, a province of Indonesia. Oceania, the Pacific Islands and small patches in northeastern Australia (Queensland) constitute this zone, in addition to a large portion of Papua New Guinea. The climate of the Pacific Islands is dominated by the trade winds and most of islands have ample precipitation. The average annual precipitation generally varies between 1 500 and 4 000 mm and the dry season is seldom severe. Locally, rainfall depends on the relief and the leeward side may be fairly dry. Mean temperature at sea level is about 23°C near the Tropics and 27°C at the equator, with little difference between the hottest and coolest months. Cyclonic disturbances mainly affect the western Pacific archipelagos (Melanesia and western Micronesia). The coastal area of northeastern Australia has a tropical wet climate and receives the highest annual rainfall in Australia. It has a mean annual precipitation of 1 500 to 2 500 mm with some areas exceeding 4 500 mm. There is a marked summer maximum (January to March). The mean annual temperature is around 23°C. Note: Data derived from an overlay of FRA 2000 global maps of forest cover and ecological zones. * Estimate uncertain because of discrepances in global forest cover map. The rain forests of the tropical Pacific Islands are generally evergreen. Their structure is comparable to that of the Indo-Malayan forests but the flora of the dominant strata is often relatively poor. The tallest hardwood forests, with heights ranging from 30 to 45 m, are found on deep volcanic soils. About a dozen species (in the genera Calophyllum, Campnosperma, Dillenia, Elaeocarpus, Endospermum, Gmelina, Maranthes, Parinari, Schizomeria and Terminalia) are the main constituents of the canopy, overtopped occasionally by banyan figs (Ficus spp.) and Terminalia calamansanai. In Vanuatu, Fiji and Samoa this forest type is somewhat lower (about 30 m) and floristically slightly different. New Caledonian flora is totally different from that of the forests in other parts of Melanesia. Clusiaceae (Calophyllum spp. and Montrouziera spp. ), Cunoniaceae, Myrtaceae, Myrtoideae, Proteaceae and Sapotaceae predominate in the upper stratum. A poorer forest grows on the limestone atolls. In certain special environments a single species dominates the upper stratum. Examples are the Nothofagus spp. forests in New Caledonia and the Metrosideros collina forest that is found throughout the tropical Pacific. Coniferous forests belonging to the Araucariaceae, Cupressaceae, Podocarpaceae and Taxaceae families have a limited distribution throughout the Pacific. Mangroves cover rather large areas in the Melanesian archipelagos and in the Caroline Islands. They can reach a height of 25 m and the main constituents are Rhizophoraceae together with species of the genera Avicennia, Lumnitzera, Sonneratia and Xylocarpus. Tropical rain forests constitute around one million hectares of Australia's forests. The forest canopy ranges from around 30 to 40 m high with emergent trees up to 50 m. They resemble the rain forests of Indo-Malaya in floristic composition except for the complete absence of Dipterocarpaceae. Australian endemics of the emergent tree strata include species of Flindersia, Cardwellia, Musgravea, Placospermum, Buckinghamia, Darlingia, Backhousia, Blepharocarya, Castanospermum, Ceratopetalum and Doryphora. The presence of several primitive and restricted angiosperm genera - Idiospermum, Austrobaileya, Sphenostemon, Bubbia, Ostrearia, Neostrearia, Eupomatia and Galbulimima - add a further distinctive character to the rain forests. In swamp forests, limited to the coastal zone, Melaleuca viridiflora paperbark forest often constitutes the main canopy species along with numerous palms. In the well-drained lowlands, woodlands and forests include Eucalyptus tereticornis, E. tessellaris, E. intermedia and E. pellita. Papua New Guinea is the only location in Oceania where this ecological zone is found. The zone is described under Asia. Small areas of this type of forest may be found in northern Australia and the Pacific Islands; however, they are too small to map and are thus included in other ecological zones. This zone is confined to the northern parts of Australia. These northern tropics have a marked seasonal alternation in moisture conditions, with an intense drought lasting six to eight months throughout the winter, followed by monsoon rainfall. The zone receives an average annual precipitation of 1 000 to 1 400 mm with around 75 percent falling in the monsoon period. The mean annual temperature is around 27°C with a mean summer maximum of 33°C. Average minimum temperatures during the monsoon period are around 23°C. The main natural vegetation is eucalypt forest and woodland. Various types occur, characterized by different dominant Eucalyptus species. The Eucalyptus tetrodonta-E. miniata suballiance occurs mainly west of the Carpentaria Gulf. It forms open to closed forests to 30 m high in the wettest areas or, in drier areas, woodlands 10 to 30 m high. In the Kimberly region this alliance often gives way to a Eucalyptus tectifica and E. grandifolia alliance. Callitris intratroopica, now mostly removed for timber, once formed local associations or with E. miniata. Melaleuca forests occur throughout the zone on damp or wet sites. Often these forests are narrow strips of dense pure stands along streams and swamps. The dominant canopy species include Melaleuca dealbata, M. leucadendra, M. minutifolia and M. viridiflora. Small patches of so-called semi-evergreen vine forests or monsoon forests occur along watercourses, around lagoons and on patches of soil fed by springs or runoff water from the uplands. The dominants are chiefly deciduous. Along the northern Australian coasts, which have tides of up to 10 m, are mangrove forests. Typically, there is a pioneer outer zone of Sonneratia caseolaris or Avicennia marina. Inland is a Rhizophora forest dominated by R. stylosa, a Bruguiera gymnorhiza dominated zone and a Ceriops tagal community. This zone is located in the northern part of Australia immediately inland of the more humid coastal zones. The semi-arid tropics of northern Australia have a marked seasonal variation in moisture conditions with a pronounced winter drought lasting six to eight months followed by substantial monsoonal rainfall. The zone receives an average annual precipitation of 700 mm, ranging from around 350 mm to 1 000 mm. Most of the precipitation occurs during December to March, with drought conditions for the remainder of the year. The mean annual temperature is around 26°C. The natural vegetation is largely eucalypt forests and woodlands. Eucalyptus tetrodonta and E. miniata forests and woodlands dominate the northern Kimberly while low and open woodlands of Eucalyptus brevifolia and E. setosa dominate the southern Kimberly. The vegetation of the centre of the zone is mainly eucalypt woodlands and acacia forests and woodlands. Common dominants are Eucalyptus terminalis and E. brevifolia. E. brevifolia often forms mosaics with other species, for instance E. tetradonta, E. dichromophloia or E. pruinosa. Lance wood (Acacia shirleyi) is the most widespread of the central northern acacia woodlands. A. shirleyi is a species up to 18 m tall that forms low woodland in the drier parts of its range, often intermingled with eucalypt woodlands. In the eastern part, Eucalyptus drepanophylla is the most common species. Another characteristic vegetation are the "boxes", medium-height eucalypt woodlands in drier areas. The main species are Eucalyptus leptophleba, E. microneuro and E. normantonensis. Callitris glauca, a common associate in some of the woodlands, is an important timber species. At the southern end of the zone, silverleaf ironbark (Eucalyptus melanophloia) becomes dominant as does Callitris glauca and brigalow (Acacia harpophylla), which has now largely been cleared. The subtropical humid forest zone comprises the east coast of Australia, roughly between 23° and 35°S, and the North Island of New Zealand. The coastal areas of southern Queensland and northern New South Wales have a subtropical humid climate with mild winters and hot summers. Mean annual precipitation across the region is 1 100 mm, with areas on the Queensland/New South Wales border receiving in excess of 2 200 mm and rain-shadow areas receiving as little as 700 mm annually. Precipitation is reasonably well distributed. The mean annual temperature of the region is around 18°C with the northern extent 3° hotter and the southern extent 2° colder. The climate of the North Island of New Zealand is strongly influenced by the ocean. Extremes of heat and cold are absent. The mean summer temperature is 16° to 18°C with mean winter temperature around 10°C. Rainfall is high, rather regular over the island and ranges from around 1 000 mm to more than 1 500 mm (on the central plateau), with the maximum during winter. The dominant vegetation in Australia is open eucalypt forest that generally exceeds 30 m tall and can often reach 50 m, while in the moist valley bottoms, warm temperate rain forests are the dominant life form. The vegetation in the centre of this region is extremely diverse. In the north the inland medium-open eucalypt forests are dominated by Eucalyptus tereticornis and Corymbia maculata (formally E. maculata) while the coastal forests are dominated by bloodwoods such as E. intermedia and E. acmenioides. Further to the west numerous rain shadows occur that are dominated by dry ironbark forests and woodlands with Eucalyptus crebra, E. fibrosa, E. tessellaris and E. melanophloia. At the centre of the region, on the Queensland/New South Wales border, warm temperate rain forest is the dominant forest type. Outside this area it mainly occurs as narrow strips in the valley bottoms of eucalypt forest. Coachwood (Ceratopetalum apetalum) characterizes the rain forests between latitudes 37° and 28°S. Codominants include Doryphora sassafras, Schizomeria ovata, Acmena smithii, Tristania laurina and Argyrodendron spp. The forests have three tree layers and in this respect resemble the richest rain forests in the tropics. Argyrodendron actinophyllum and A. trifoliolatum are present in the stands, and other tree species belong to the Lauraceae, Simaroubaceae, Rutaceae, Meliaceae and succulent-fruited Myrtaceae, especially Syzygium. In areas with lower rainfall, a drier type of rain forest appears, characterized by Drypetes australasica, Araucaria spp., Brachychiton discolor and Flindersia spp. To the south of the Queensland border, medium to tall open eucalypt forests dominate the landscape, with dozens of distinct floristic communities. The main medium-open forest types include Eucalyptus pilularis, E. saligna and E. maculata, while E. acmenioides and E. microcorys dominate the tall forests. Conifer-broadleaf forest represents the "subtropical" or warm-temperate evergreen forests of the North Island of New Zealand. Conifers, where present, form the tallest storey, usually as well-spaced, large-crowned trees, but they can also form continuous canopies. Most of the tree species are podocarps of the genera Podocarpus, Dacrycarpus, Dacrydium and Phyllocladus, the tallest species reaching heights of over 40 m, exceptionally 60 m. There are also two species of Libocedrus (Cupressaceae) and, north of 38°S, the massive kauri (Agathis australis). Hardwoods and some of the less-tall podocarps form the next storey, which is usually the main canopy. Species include Beilschmiedia, Knightia, Laurelia, Litsea and Nestegis. A host of small trees form a subcanopy and fill gaps. Small patches of beech forest (Nothofagus spp.) occur on poor soils and at higher altitudes. This climatically very distinct zone is found in two locations in southern Australia: the southwestern tip around Perth and the central east around Adelaide. The climate occurs in two slightly different Mediterranean forms and has a significant rainfall gradient that has a major impact on the type of vegetation. The area approximately 200 km south and east to 500 km north of Perth in Western Australia has hot, dry summers. Mean annual precipitation within is around 750 mm to 1 000 mm, mostly falling between May and August. The annual average temperature is around 16°C. The southern tip of Western Australia and areas to the south of Adelaide in South Australia have slightly cooler summers and are subject to a significant rainfall gradient. The region receives 400 to 800 mm of annual precipitation in Victoria and South Australia and between 1 000 mm and 1 300 mm on the southern coast of Western Australia, with approximately 60 percent falling between May and September. The annual average temperature is 15°C. The south coast of Western Australia is generally around two degrees warmer than the rest of the zone. The vegetation in the southwest is floristically distinct from the rest of Australia. On fertile soils derived from granite, two tall forests occur: karri (Eucalyptus diversicolor), where rainfall exceeds 1 000 mm in the south, and red tingle (E. jacksonii). On laterite and lateritic strew, jarrah (E. marginata) and marri (E. calophylla) are dominant and on the coastal limestones, tuart (E. gomphocephala). Karri is one of the tallest eucalypts in Australia and can reach a height of about 85 m and a diameter of about 7 m. The Eucalyptus marginata-E. calophylla association is most widely distributed in this zone, between the 600 and 1 300 mm isohyets. Forests up to 40 m high, with an almost closed canopy, occur in the wetter areas while in drier areas the forests reach a height of 12 to 24 m and are more open. The original vegetation covering the Lofty Block and the Naracoorte Coastal Plain was significantly different from the agricultural lands and low open eucalypt woodlands that occur there today. The region was originally dominated by low to medium eucalypt woodlands in the lower rainfall areas with gum and peppermint species such as Eucalyptus leucoxylon and E. odorata and shrubby understoreys. Medium-open stringybark forests comprising Eucalyptus baxteri, E. obliqua and E. viminalis and shrubby understoreys dominated the higher rainfall areas. Vegetation of the Naracoorte Coastal Plain was similar in many areas to that of the Lofty Block, with the addition of heaths in the poorly drained lowlands and inter-dune swales and eucalypt mallee formations. This zone is confined to Australia and separated into two distinct units, a northeastern part with typical subtropical characteristics and a southern part with "warm temperate" influences. The northeastern area has a significant climatic gradient that has a major impact on vegetation. Southwestern Queensland and northwestern New South Wales have a subtropical semi-arid climate with mild winters and hot summers. The mean annual precipitation of 350 mm is fairly evenly distributed throughout the year, with a slight increase from December to February. The mean annual temperature of the region is around 2°C. The region is commonly known as the Mulga Lands. Southern central Queensland and northern central New South Wales have a subtropical semi-arid climate with mild winters and hot summers. The mean annual precipitation is 560 mm, decreasing to 350 mm towards the interior and increasing to 700 mm on the western slopes of the Great Dividing Range. Precipitation is evenly distributed throughout the year, with a slight increase from December to February. The mean annual temperature of the region is around 19°C. This zone covers regions commonly known as the Southern Brigalow Belt, the Darling Riverine Plain, the South Western Slopes of New South Wales and the Cobar Peneplain. The southern part has a semi-arid climate with a marked winter increase in precipitation. It has average annual precipitation of 375 mm with as little as 250 mm in inland areas and up to 600 mm at higher altitudes (300 m) towards the coast. Precipitation is markedly winter dominant, increasing from east to west. The mean annual temperature is around 17°C. Low Acacia aneura woodlands and shrublands commonly known as "mulga" dominate the Mulga Lands. This species occurs as small trees in the higher rainfall eastern margins and as low shrub towards the interior. Five primary vegetation types occur within the Southern Brigalow Belt. These are: ironbark woodlands on the eastern margins (Eucalyptus crebra, E. alba); ironbark and Callitris forests (E. crebra, E. fibrosa and Callitris glauca); brigalow forests and woodlands (Acacia harpophylla) and poplar box woodlands (E. populnea) in the central and interior regions. All also occur as mixed forest and mosaics of relatively pure stands. Callitris glauca is a very important commercial species that can form very pure stands over extensive areas. River redgum (E. camaldulensis) and blackbox (E. largiflorens) dominate the Darling Riverine Plain. The Cobar Peneplain is dominated by mulga (Acacia aneura) shrublands. Other species include myall (A. pendula), nelia (A. loderi) and gidgee (A. cambagei). Box woodlands dominate the South Western Slopes: Eucalyptus albens, E. melliodora and E. blakelyi on the slopes and greybox (E. microcarpa) and ironbark (E. sideroxylon) woodlands in the lower rainfall regions. All the above vegetation communities have considerable economic importance. They all provide grazing for domestic stock and large tracts have been cleared for cultivation. Mallee is the dominant natural vegetation over large areas of the Murray-Darling, Riverina, Eyre and York Block and Mallee regions of Western Australia. The term "mallee", an aboriginal word, describes eucalypts with many stems arising at ground level from a large, bulbous woody structure called a lignotuber or "mallee" root. There are more than 100 mallee species and many species that occur as both mallee and tree forms. Common species include: white mallee (Eucalyptus diversifolia), which dominates the wetter communities in South Australia; lerp mallee (E. incrassata) and narrow-leaved red mallee (E. foecunda), occurring on deep sands; giant mallee (E. socialis), congoo mallee (E. dumosa), yorell (E. gracilis) and redwood (E. oleosa) characterizing the main mallee alliance in the east; and tall sand mallee (E. eremophila), confined to Western Australia found over a wide range of soil types. In more arid areas mallee is usually replaced by acacias and at the upper rainfall limit (circa 400 mm per year) by single-stemmed eucalypts, often of the same species. The Wheatbelt region of Western Australia has been highly modified for agriculture and today only remnants of the original vegetation exist. Medium-height eucalypt woodlands 10 to 30 m high with low understoreys were once dominant with Eucalyptus marginata (jarrah) forests in the higher rainfall areas to the west giving way to E. wandoo (wandoo) and then E. salmonophloia (salmon gum) with decreased rainfall. This zone covers the southeastern coast of Australia, Tasmania and the lowlands of South Island, New Zealand. The southeastern coast of mainland Australia and Tasmania has a humid, mild winter climate. Annual precipitation varies from around 600 mm in the Gippsland region in Victoria to in excess of 2 000 mm in western Tasmania. Precipitation is distributed throughout the year with a slight winter dominance, more pronounced in western Tasmania. The annual average temperature varies from around 9°C in western Tasmania to 13°C in southern Victoria and eastern Tasmania. The western, coastal part of South Island of New Zealand has a humid climate. Annual rainfall ranges from around 1 800 mm to locally more than 4 000 mm, rather evenly distributed throughout the year. To the east of the Southern Alps, the climate is distinctly drier, with annual rainfall from 400 to 800 mm, locally below 400 mm. Also, temperatures become more extreme here, as the region is sheltered from the moderating western ocean winds. The mean annual temperature ranges from 13°C in the north to 9° in the south. Cool temperate rain forests are found in the wetter parts of western Tasmania. These forests are often dominated by myrtle (Nothofagus cunninghamii) with conifers such as huon pine (Lagarostrobos franklinii), celery top pine (Phyllocladus aspleniifolius) and King Billy pine (Athrotaxis selaginoides). In lowland areas, the rain forests are dominated by Anodopetalum biglandulosum. In Victoria, cool temperate rain forests occur in restricted areas in the coastal ranges. Dominant canopy species include southern sassafras (Atherosperma moschatum), Acacia melanoxylon and mountain quandong (Elaeocarpus holopetalus). Dry ash, stringybark and peppermint forests (Eucalyptus sieberi, E. gummifera, E. botryoides, E. radiata and E. dives) dominate areas of moderate rainfall to the east of this zone on the mainland and Tasmania. Tall forests dominated by Eucalyptus viminalis, E. fastigata, E. obliqua and E. cypellocarpa replace these forests in higher rainfall and protected areas. Many of the wetter areas of this zone in Tasmania are dominated by tall messmate/stringybark forest (Eucalyptus obliqua and E. nitida). The basalt plains of western Victoria were once dominated by wet E. obliqua and E. cypellocarpa forest but most of these have since been cleared. Beech and conifer-beech-broadleaf forests dominate the western lowlands and lower hills of New Zealand's South Island. Nothofagus fusca is characteristic of conifer-beech-broadleaf forests in the northwest. In these forests, conifers form a scattered overstorey with Dacrydium cupressinum and Podocarpus ferruginea as the main species. Beeches form the main canopy, with Nothofagus fusca predominating on the deeper, more freely drained sites, but usually mixed with N. truncata, N. menziesii and N. solandri. On optimal sites, Weinmannia racemosa and, in places, Quintinia acutifolia form a tall subcanopy. In the extremely humid fjord country in the southwest, where rainfall exceeds 6 000 mm, the Nothofagus forests are similar in nature to those of southern Chile. Nothofagus menziesii is the dominant species. The east of South Island has little forest vegetation owing to much lower rainfall. Patches of beech-conifer-broadleaf forest occur, adjoining a wide variety of mostly anthropogenic vegetation. There is evidence that, prior to human intervention, a zone of microphyllous woodland, consisting of species such as Coprosma virescens, Discaria toumatou, Leptospermum ericoides, Olearia lineata and Sophora microphylla, grew under moisture regimes intermediate between those supporting forest and semi-arid grasslands. In Australia, this zone consists of the Tasmanian Highlands, the Southeastern Highlands, the Australian Alps and the New England Tablelands. New Zealand's Southern Alps on South Island are also part of the zone. The highlands and tablelands of southeastern Australia have a cool temperate climate with annual precipitation ranging from around 600 mm at lower elevations to 1 200 mm at higher elevations. Precipitation is evenly distributed throughout the year, with most months receiving 70 to 80 mm. The annual mean temperature is around 12°C with mainland areas around 2° hotter and Tasmania 4° cooler. The Alps region of southeastern Australia receives average annual precipitation of 1 300 mm, with higher elevation areas receiving in excess of 2 000 mm, much of it as snow. Precipitation is fairly evenly distributed throughout the year. The annual average temperature for the region is around 9°C. The climate of the Southern Alps in New Zealand is cold temperate, characterized by high annual rainfall, particularly on the western slopes. Frost and snow are abundant in winter and to some extent at all seasons. The lower-elevation rolling hills of the southeast highlands and the elevated plateaus and hills of the New England Tablelands were originally covered with eucalypt forests and woodlands of stringy bark/peppermint/box species, including Eucalyptus caliginosa, E. laevopinea, E. nova-anglica, E. melliodora, E. albens and E. blakelyi. Today, these communities mainly occur as open woodlands used for grazing. In sheltered areas receiving more than 1 000 mm annual rainfall, tall wet eucalypt forests dominate with species such as alpine ash (Eucalyptus delegatensis), mountain white gum (E. dalrympleana) and manna gum (E. viminalis) forming open forests where the canopy exceeds 40 m. The outstanding example of these forests occurs in the southern ranges of southern Victoria and Tasmania where mountain ash (E. regnans) trees commonly exceed 70 m in height and can reach over 90 m on the best sites. In Tasmania, cool temperate rain forests are dominated by myrtle (Nothofagus cunninghamii) while blackwood (Acacia melanoxylon) often forms an understorey 10 to 30 m tall. The lower- and medium-altitude zones of the mountains of South Island, New Zealand are mostly covered by beech forest. Nothofagus solandri var. cliffortioides or N. menziessi constitute most of the subalpine forests. The timberline is at around 1 200 m in the north and decreases to around 850 m in the south. Locally, beech forest is absent and depauperate conifer-broadleaf forest extends into the subalpine belt. Its conifer storey consists of Podocarpus halii, often accompanied by Libocedrus bidwillii, while the main canopy consists of Weinmannia racemosa, Metrosideros umbellata or, in certain circumstances, small trees such as Dracophyllum traversi, Griselinia litoralis and Olearia ilicifolia. Australian Surveying and Land Information Group (AUSLIG). 1990. Atlas of Australian resources. Volume 3. Vegetation. Commonwealth of Australia. Australia. National Forest Inventory. 1998. Australia's state of the forests report 1998. Canberra, Bureau of Rural Sciences. Beadle, N.C.W. 1981. The vegetation of Australia. Cambridge University Press. Cockayne, L. 1921. The vegetation of New Zealand. Die Vegetation der Erde, Volume XIV. Leipzig, Germany, Engelmann. Groves, R.H. 1981. Australian vegetation. Cambridge University Press. Schmid, M. 1989. The forests in the tropical Pacific Archipelagos. In Tropical rain forest ecosystems: biogeographical and ecological studies. Eds H. Lieth & M.J.A. Werger. Ecosystems of the world 14b. Amsterdam, The Netherlands, Elsevier. Stocker, G.C. & Unwin, G.L. 1989. The rain forests of Northeastern Australia - their environment, evolutionary history and dynamics. In Tropical rain forest ecosystems: biogeographical and ecological studies. Eds H. Lieth & M.J.A. Werger. Ecosystems of the world 14b. Amsterdam, The Netherlands, Elsevier. Thackway, R. & Cresswell, I.D. (eds). 1995. An interim biogeographic regionalisation for Australia: a framework for setting priorities in the national reserves system cooperative programme. Version 4.0. Canberra, Australian Nature Conservation Agency. Wardle, P., Bulfin, M.J.A. & Dugdale, J. 1983. Temperate broad-leaved evergreen forests of New Zealand. In Temperate broad-leaved evergreen forests. Ecosystems of the world 10. Ed. J.D. Ovington. Amsterdam, The Netherlands, Elsevier.